I have my dog to thank for my growing interest in foraging. Every day when we go for our walk, he sniffs out doggy smells while I fossick in the verges looking for edible weeds. Some of the leaves, flowers and young seeds pods I find are nibbled en route, some are rejected (I can’t see why you’d bother eating gorse flowers) and the rest end up in salads and sitrfrys. The foraging trend is growing apace. 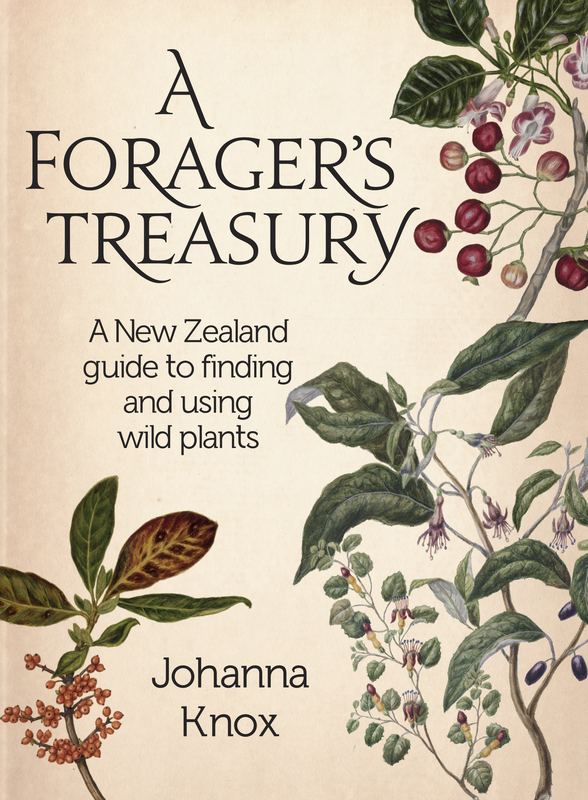 I’ve written two features this year with foraging chefs Anthony North and Bill Manson (both for NZ Life & Leisure) and I’ve recently received a review copy of the latest book on the subject, A Forager’s Treasury by Wairarapa-based writer and researcher Johanna Knox. It joins four similar books on my bookshelf and it’s easily the best for my purposes. Having said that, it is sadly let-down by poor presentation – cheap paper, messy layout, no index and insufficient illustrations – and that really is a shame because the content is excellent. It’s informative, well-researched, insightful and full of inspiring ways to use wild plants. 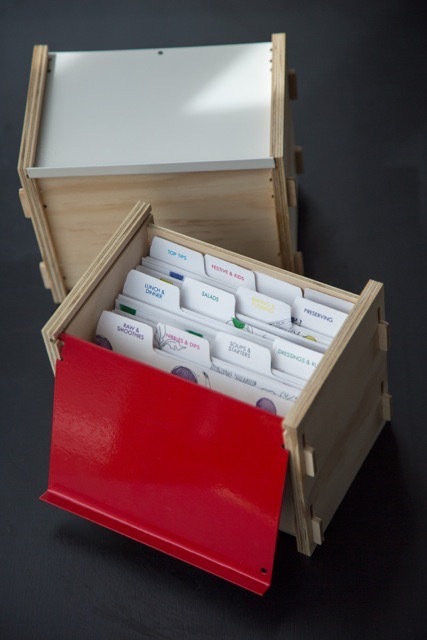 The first half of the book is dedicated to identification and general information on foraging. Common poisonous plants such as hemlock are listed (but not illustrated) in the introductory section and this is followed by a large section on edible ‘treasures’. These plants are divided into families (alliums, legumes, etc), which is a useful way of looking at things, assuming some knowledge of plants. Knox provides excellent information on each one – how to find them, what they taste like and what to do with them – but the few line drawings included aren’t sufficient to inspire confidence in a new forager. When it comes to identification there really is no substitute for photographs. The second half of the book investigates the many ways in which you might use foraged plants: medicinal and cosmetic but most of all edible. I would buy the book for this part alone with its handy tips and collection of inspiring but sensible ways to eat weeds. I say ‘sensible’ because I’ve seen some frankly weird recipes in similar books on wild food, recipes that come across as desperate attempts to find a use for a foraged ingredient just because it is foraged. 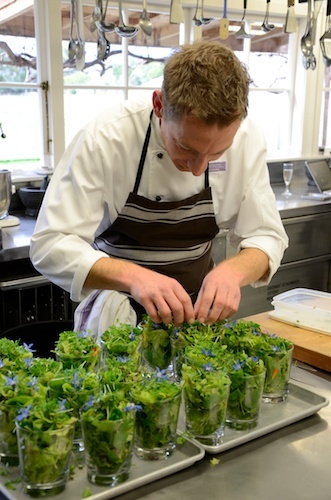 Knox, on the other hand, comes across as a good cook with a well-tuned sense of what goes with what and an understanding that every ingredient must earn its place. 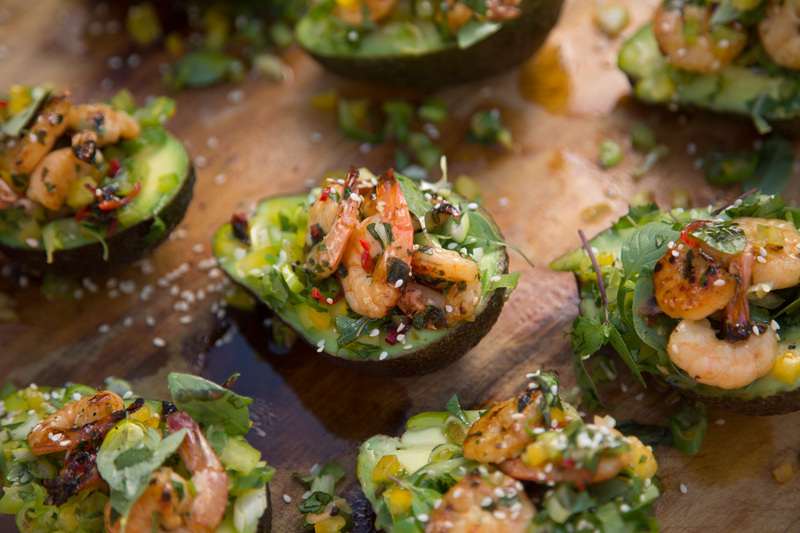 Often that place is in a salad, a dip or a sandwich and there are plenty of ideas for these. There are also some good basic recipes that come with loads of variations. I’m keen to follow her suggestions for infused syrups and herbal teas, and I’m intrigued by the idea of making pannacotta with cream that’s been infused with scented pelargonium leaves or wild jasmine. I particularly like the section on wild salads because it not only lists all the likely candidates but divides them up according to texture and flavour. Some plants are mustardy, some are bitter or sour, and some may be crunchy while others are soft. It’s all useful information when it comes to creating a well-balanced salad. 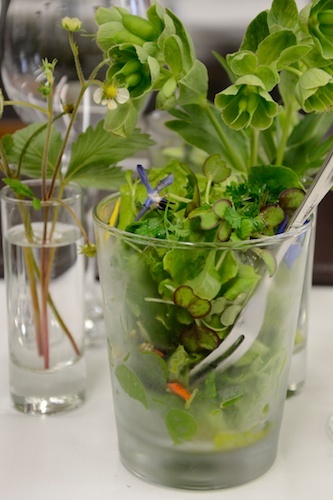 And when it comes to salads, I love the idea of tossing lemony-flavoured oxalis leaves through a creamy potato salad. I don’t even have to walk the dog to find this common weed, my garden is full of it. I’m also well stocked with onion weed and thanks to this book I’m actually looking forward to the spring flush when I’ll have plenty of flowers to deep-fry in tempura batter. Angela Redfern does it again! The first cookbook from the owner of Ripe Deli in Auckland has been on my ‘favourites’ pile since it was published more than two years ago. 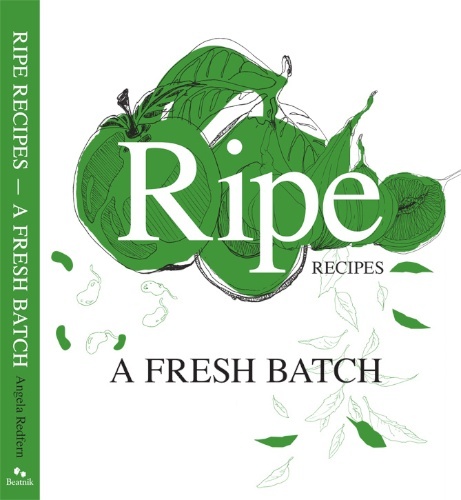 Its seasonal collection of interesting everyday recipes still inspire me to dash out to Moore Wilson for the essential ingredient – chorizo, mozzarella, quinoa or quince – and now I’m making new shopping lists with Redfern’s new book, Ripe Recipes: a Fresh Batch. The colourful up-close photography and whimsical line drawings of book number two are reassuringly familiar – the same team is behind both publications – but there’s new territory here too. The recipes are no longer grouped according to season but by chapters that follow the internal workings and food categories of Ripe, the delicatessen. I’ve never stepped inside the store but I now know that Friday is Pie Day and once a month Ripe has a Mexican Day. I’m not sure if this is the best way to organise a cook book but once you get used to what’s where, the recipes themselves are fabulous. They are eclectic in true deli style. 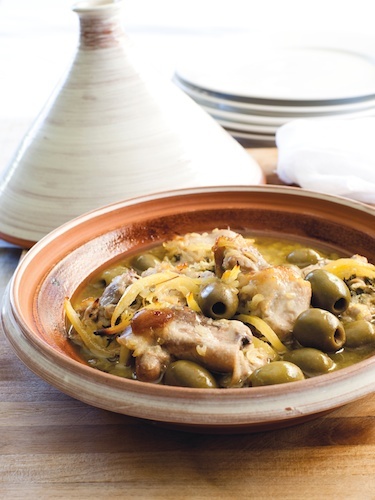 A chapter headed Deli Dinners takes care of the take-home favourites such as osso bucco and shepherd’s pie; three recipes for cheesecake give the retro nod to a dessert of the 70s and there’s plenty of the Mexican and Middle Eastern inspired dishes that are currently trending. Best of all are the salads. Ripe number one’s stunning collection was a hard act to follow but the Fresh Batch of salads is every bit as good as the last – colourful, crunchy, tasty and loaded with a healthy variety of grains. The emphasis is on nutrition with lots of tofu, sprouts, seaweed and so forth, but for me that’s of secondary importance. I’m guided by taste, texture and presentation; the rest will naturally follow. How could Fattoush Salad with Chicken, Pistachio and Pomegranate not be good for you? Last night I made The Green Queen Salad. I gather it’s a deli favourite, which makes me sympathise with the kitchen hand whose job it is to carefully pull the leaves off the brussel sprouts that complete this arangement. I lost patience and tore at mine so they didn’t look great, but the green-on-green vege and buckwheat salad was otherwise magnificent (recipe follows). I served it with fresh snapper fillets fried in butter. 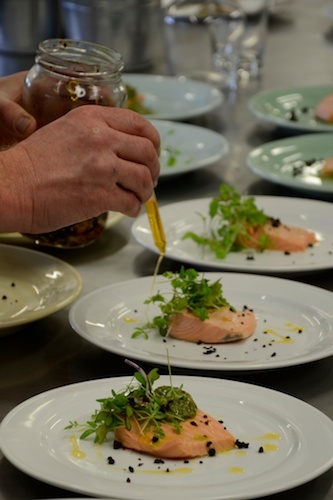 It would go equally well with Ripe’s Cured Fennel Salmon. 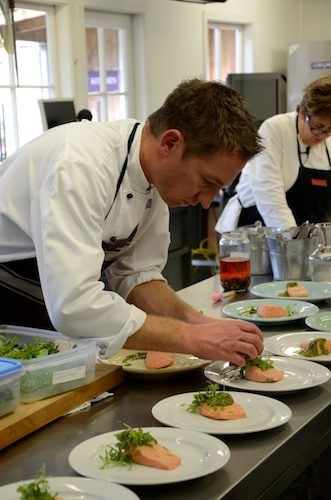 The method for the salmon is unusual in that the fish is both cured and cooked. I’ve only ever done one or the other so I bought a side of salmon to test it out. I found it combined the best of both methods – my salmon had a sweetly glazed exterior with meltingly soft flesh beneath. I meant to follow instructions and use the leftovers for Salmon Hash Cakes – the picture looks very moorish – but when I went to the fridge, the salmon was gone. No leftovers. A sure sign of success in anyone’s book. This is a great salad by Gawain Cowley. It is bound to bring out the superhuman strength in all of us! A dear customer voted it the best salad she had ever had at Ripe. To prepare the buckwheat: place a medium saucepan of water over a high heat and bring to the boil. Add one cup of the buckwheat and boil for 10 minutes or until tender. Remove from the heat and strain. Set aside to cool. To prepare the salad: place a large saucepan of water over a high heat and bring to the boil. Add all the vegetables (except for the spring onions and crunchy bean sprouts) and blanch for 30 seconds. Strain, refresh under cold running water and drain well again. In a large bowl, place the blanched salad greens, spring onions, crunchy bean sprouts and boiled buckwheat. Pour the dressing over the salad, season to taste with salt and pepper, and toss well to combine. 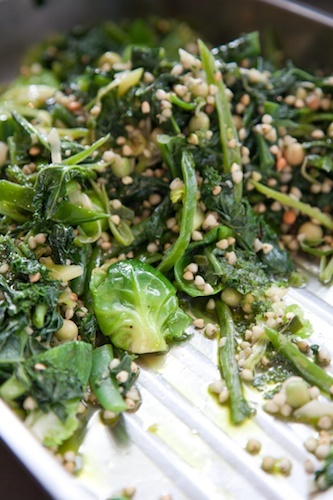 Transfer the salad to a serving dish and sprinkle with the toasted buckwheat. This dressing is packed full of goodness. We use it in the Green Queen Salad on page 81. This recipe makes a generous quantity. Add it to any salad that needs a good boost of flavour. Slice through the very top of the garlic bulb, exposing the cloves. Drizzle over one tablespoon of the olive oil, wrap in foil and bake for 30 minutes or until garlic is caramelised. Remove from the oven and set aside to cool. When cool, squeeze the garlic from the bulb into a small bowl. I’m not a good baker of cakes. I blame this partly on my oven, which is a commercial gas monster with an unreliable temperature gauge, and partly on my inability to follow a recipe. I can’t stop myself making adjustments and, as we know, this can be fatal when baking cakes. 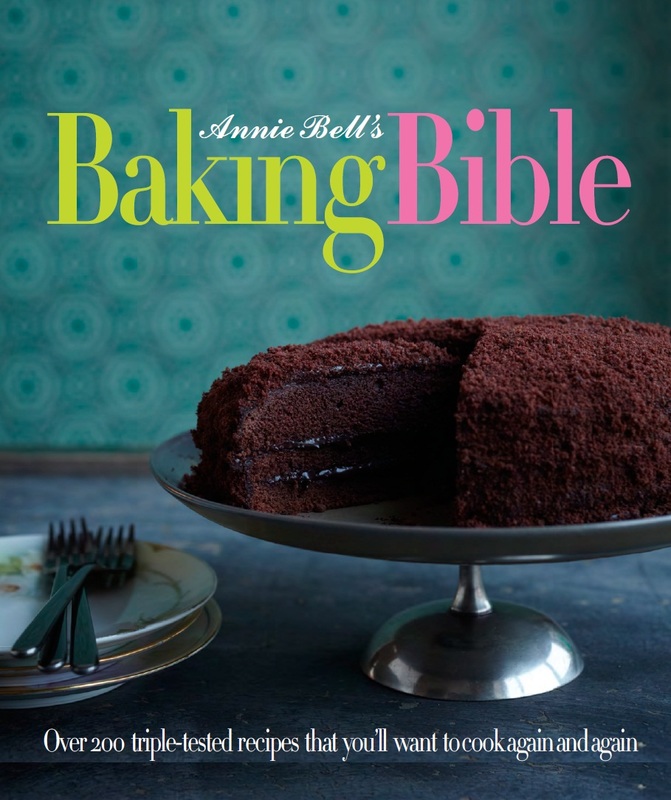 So when I got sent a review copy of Annie Bell’s Baking Bible I thought the publishers had got me mixed up with another food writer – a domestic goddess who knows her sponges from her pound cakes, perhaps. I could have sent it back but instead I found myself flicking through the pages admiring the photography and the next thing I knew I was marking it with post it notes. There are a huge number of baking books out there but this is the best I’ve seen. It really is a bible. Not only that, it’s a lovely looking book; a hefty hardback, nicely set out and easy to follow, in line with the writer’s pared back philosophy to baking. The ingredient lists finish with ‘little extras’ should you wish to dress things up but what I like is the emphasis on the cake/biscuit/tart itself. I have no doubt these recipes will work; Annie Bell is noted for the care she takes designing recipes. She has written for Vogue and the Independent and has been, for many years, the food writer for the Mail on Sunday’s magazine. I’m sure I’ll bake lots of the recipes in this, her latest book. I’ve bookmarked the New York cheesecake, salted caramel flapjacks, saffron lemon crisps and cannelés Bordelais. The latter are my favourite and I’m delighted to discover Annie thinks cannelé’s are no harder to produce than clafoutis. I have a set of silicone cannelé moulds that I’ve been too intimidated to use until now. 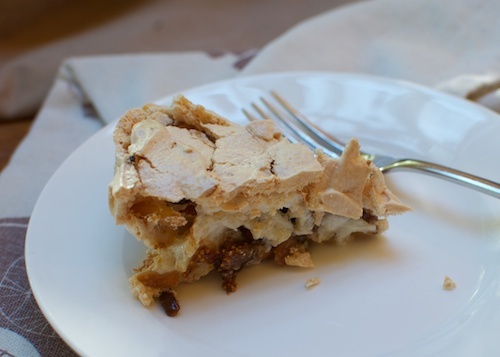 For the purposes of this review I decided to test the Ginger, Almond and Fig Meringue Cake. I was encouraged by the photograph showing a lovely broken crust, which I was sure I could emulate, and the notes that said it was “endlessly adaptable”. Ginger, almond and fig meringue cake. Baked by me. In order to give it a fair trial I promised self-restraint and followed the recipe to the letter. It was really easy and turned out just like the picture in the book. I took it to a fireworks party the same night, where it was wolfed down so fast I had to beg a spoonful from someone else’s plate. It’s a cake I plan to make often, only next time I will revert to type and make a few adjustments – pistachio nuts, figs and a dash of rose water will ring the changes for Christmas. It’s said a picture is worth a thousand words but when it comes to food I’d much rather describe the experience in words. Food photography is an incredibly difficult field. I’ve tried and I’ve always failed to convey the flavour and appetite I’ve felt when presented with a plate of something delicious. I mean, how do you photograph taste? I’ve worked with some professionals who manage to do just that: photographers who make me want to eat the images they create. 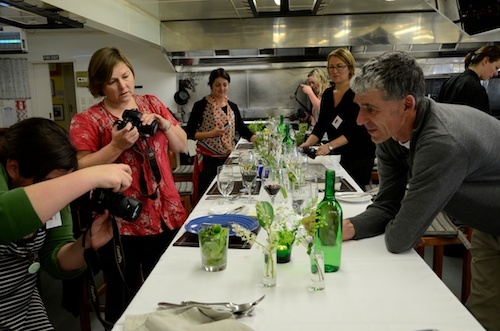 I’ve always wondered how they do it, so when food photographer Murray Lloyd and food writer Ruth Pretty offered a food photography workshop as part of Wellington on a Plate, I was one of the first to sign up. Food photography workshop with Murray Lloyd (right). Ruth and Murray have collaborated on five cookbooks over the past few years and created hundreds of photographs. Each one takes several hours to produce, beginning with a brainstorming session to define the sort of look they want to achieve. The workshop took us through the process from concept to shoot. We learnt how each dish is styled, what props are used, how it’s lit and how it’s composed in the frame. Murray prefers to work with natural light and the only trickery Ruth uses is a paintbrush and a little oil to make the food glow. Our first assignment was pastry. We had half an hour to style and photograph a group of small pies using a choice of plates, fabrics, cutlery and coloured card backdrops. We had to consider light, composition, texture, colour etc. It was quite a lot to think about. 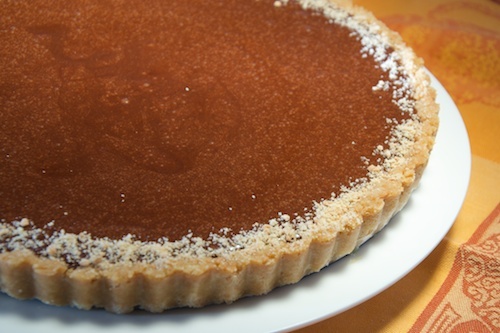 We were also advised that an uneven number of pies would look best on the plate, which meant I had to eat one of mine. It was really nice: chicken and cranberry. Anyway, after much rearranging of props I managed to get everything in frame. This is my picture of Ruth’s chicken pies. Notice how I have used an S shaped composition and also repeated the circular forms of the pies in my choice of material. 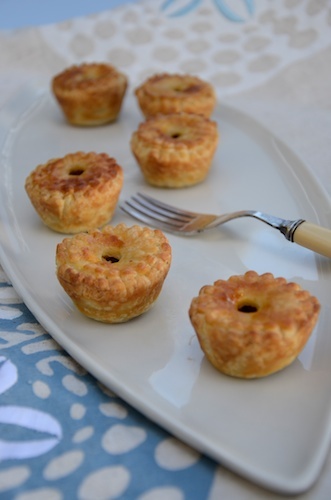 I was rather pleased with my effort but the pies still look flat and lifeless – I blame the natural light, which naturally hid behind a cloud just as I was ready to shoot. 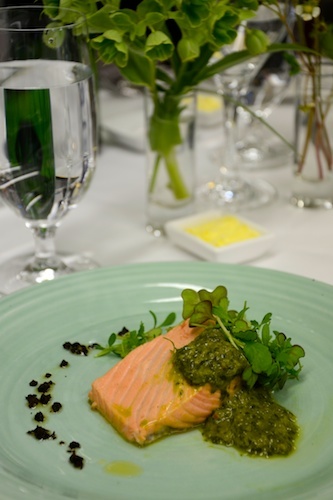 Next up was poached salmon with pesto and micro greens. The dishes were plated by Ruth’s sous chef Kirk and they were supposed to be photographed as if in a restaurant, which was good practice for me because this is the sort of situation where I do sometimes have to get a shot that’s fit for publication. I’m not sure that my salmon photo cuts it but I did like the artful positioning of the fork in my salad closeup (below). 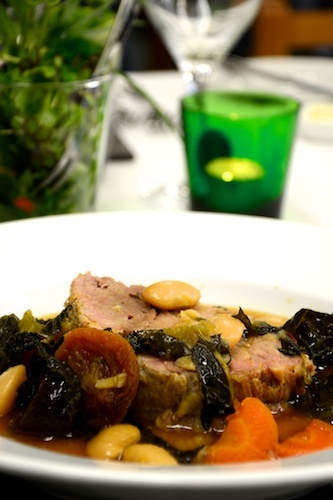 The main course was slow braised pork shoulder with apricots, prunes, lima beans and cavalo nero. It tasted fabulous but it was really tricky to photograph on account of the cavalo nero which looked limp, wet and much too black. Interestingly, Murray picked this shot out, kindly illustrating the clever way in which I had positioned the orange chair in the background to echo the orange of the carrot on the plate. I could see how this did make the colours “sing” but I hadn’t planned it that way. And therein lies the difference: a real food photographer would have left nothing to chance; my success was entirely accidental. And unlike a professional shoot, where you really don’t want to eat the food that’s been fiddled with for hours, we polished off the lot. In fact, it all looked so good that by lunchtime my creativity lost the battle with my appetite; after a cursory effort I swapped my camera for knife, fork and napkin. So what did I learn? If in doubt, zoom in close; and if the food looks lifeless, toss in a few flowers. But seriously, I have a new appreciation of just how much work goes into making food look so good on the page. A slide show of some of the photographs from Ruth’s new book – one or two of which were the same dishes we’d struggled to compose earlier in the day – served to illustrate the point: we really do eat with our eyes. Here’s a sneak preview of the front cover. 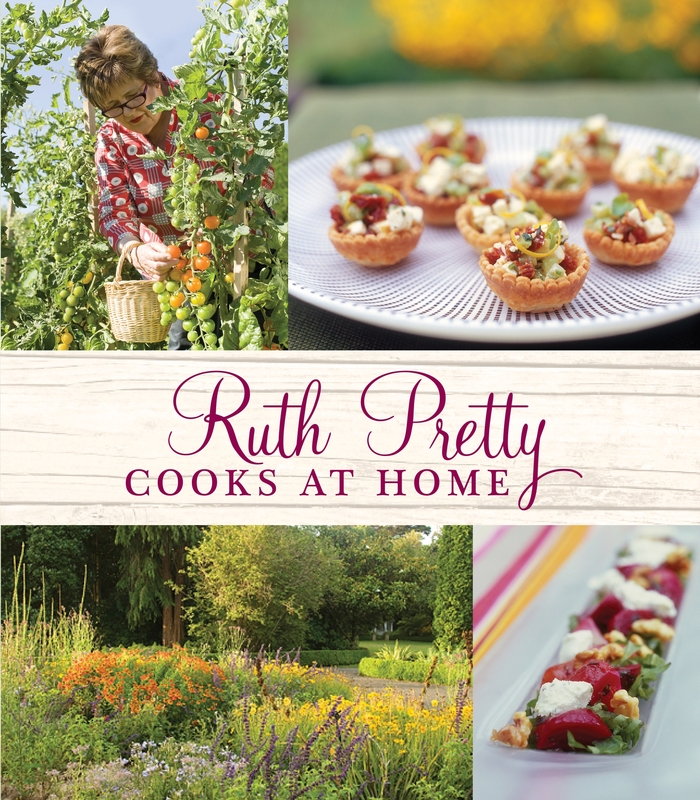 Ruth Pretty Cooks at Home is due out in October, RRP $65, published by Penguin. Photos by Murray Lloyd. Is there a food writer out there that doesn’t urge us to eat ‘seasonal and local’? The universality of the theme in cookbooks and magazines, and on television and radio, make it sound like some sort of foodie trend rather than the natural way of feeding ourselves. It’s true we did need reminding. Somewhere along the way we lost touch with the natural scheme of things. Seduced by the availability of fresh produce all year round – grapes from California, green beans from Africa – it was easy to eat with no regard to seasonality or country of origin. But I think we’ve got the message. And then with that out of the way she stops banging on and lets the recipes do the talking. The book is divided into seasons, each one prefaced with a garden calendar because she’s not just a cook she’s also a gardener. She knows what to plant and when to pick it, and because she eats what she grows she’s probably a locavore too. Happily, she’s not a vegetarian; there are some lovely cuts of meat and fish slipped in between the freshly picked greens and bottled fruits. So I do love this book. But I have to admit, I didn’t expect to. 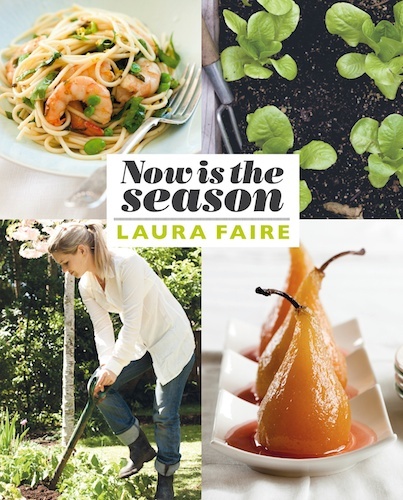 When I first saw Laura Faire’s column in the Sunday Star Times I thought – here we go, another blonde gardener/cook who looks terrific in gumboots. 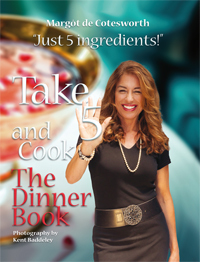 But I’ve been completely won over by her down-to-earth cookbook. It’s beautifully photographed by Kieran Scott who goes close up on the food and the garden. I love the full-page photograph of what I assume to be Faire’s own hands, grubby from the garden with dirt under the nails, opening a pod of broad beans. It’s simple and honest, and it sets the theme for the book. Each recipe relies on a few fresh tasting ingredients; there’s nothing complicated but there are some lovely combinations. Grapefruit Marmalade Crème Brulée strikes me as a really good idea. I’ll certainly make the Warm Duck and Black Grape Salad; I like the sound of Goat’s Cheese with Lemon and Sage and I’m prepared to try the odd sounding Cauliflower and Cinnamon Soup becasue Faire says it’s her own “emergency dinner party fall-back”. There are lots of recipes using easy to grow vegetables like kale and jerusalem artichokes, and there are some useful gardening tips, but you don’t need to have a vege plot to use this book. Apart from one or two things like quince and green garlic, the ingredients are readily bought. I only grow a few things myself – tomatoes in the porch and herbs in what was our old sandpit – but I was thrilled to find a couple of recipes for sorrel, which grows like a weed in my patch. I’ve made the sorrel pesto; it’s really tasty and because it’s not cooked it doesn’t lose its bright colour, which is always a problem with sorrel. I’m embarrassed to say how many cookbooks I own and I’m ashamed to say how little I cook from most of them, but this one is already bristling with little post-it markers, a sure sign I’ll be using it heaps – through summer, autumn, winter and spring.